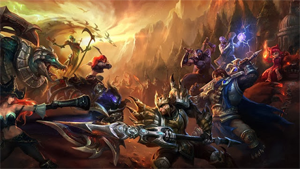 Do you enjoy dishing out tons of CC and perma-stunning enemy champions in place? Do you delight in long-ranged spells with low counterplay? Try out this team comp for size! It's got plenty of front line, crowd-control, and more importantly an awesome theme. Check out the Back to Your Roots Comp! Jhin [Marksman] - When it comes to long range rooting, few can do it as well as Jhin. He provides perfect follow-ups all your other champions, and in a pinch he can also use his ultimate to engage and make it super easy for your team to hit their snares to begin a long CC chain. Lux [Mid] - The best part about Lux is how absolutely safe she is. Even if you miss a few spells, her long-range ensures that she's still safely out of range of any potential dangers. Meanwhile, her nearly unavoidable slow allows your team to easily land skillshots. Morgana [Support] - The queen of roots herself, Morgana plays a crucial role on this team as a source of aggro and AOE CC. Her black shield also allows Illaoi to do her thing without worrying about the enemy team locking her down. All in all, she'll probably spend more time supporting Illaoi and less time supporting Jhin since he'll be tucked safely away at a distance for most fights. Maokai [Jungler] - You can't make a root comp without including Maokai! This tree also offers a ton to this team in the form of a front line and AOE crowd-control. He's perfect to lead off dives, and works wonders with a Righteous Glory. Illaoi [Top] - Although she doesn't have a real "root", her tentacles will provide some insane burst damage during the length of your team's crowd-control spells. She also makes for a great distraction and can put on a highlight reel worthy performance in combination with Morgana. Funneling enemy teams into narrow corridors will maximize this team's effectiveness greatly. Itemizing against this team is very difficult as a result of the wide spread and high AOE damage. Split-pushing works well if Illaoi is ahead since this team can turtle for days. Countering this team mostly involves using plenty of disengage and preferably a few get out of jail free cards. Lissandra [Mid] - Freeze yourself if you run into trouble, and also dive their backline while their frontline tries to engage on your team. Kindred [Jungle] - When it comes to get out of jail free cards, Kindred is perfect. Much of the enemy team spells are slow snares, so you can easily cast your ultimate and prevent death by Lux laser. Gangplank [Top] - Every part of his kit will be extremely useful here, ranging from the poke damage to all-powerful remove scurvy. Janna [Support] - When it comes to disnegaging, Janna is queen. Make sure to keep Illaoi away from her tentacles and you'll simultaneously keep your teammates away from death. Sivir [Marksman] - Waveclear is extremely important when it comes to beating down this enemy team, and Sivir does it best. Meanwhile, her spellshield will certainly save you more than once against a team with this much crowd-control. Overall this counter team is strong as well, but more difficult to execute well.